Tumor regression after therapy pairing CTLs and CTL4-A blockade. (A) Outline of therapeutic time course. (B) Kinetic response of three melanoma lesion volumes over time. (C) PET and CT images of melanoma lesions, arrow colors correspond to masses quantified in B. (D) Patient also developed vitiligo as evidenced by depigmented eyebrows and eyelashes. Though still in its early days with challenges to overcome, cancer immunotherapy has the scientific world abuzz. Here at Fred Hutch, multiple labs have successfully retrained T cells to recognize and destroy cancer cells. The initial focus of this approach has been to identify unique qualities of tumors so modified T cells can specifically target the disease. These efforts have uncovered cancer enriched/specific antigens for leukemias, pancreatic ductal adenocarcinoma, melanoma, and other diseases. Such cancer enriched/specific antigens allow T cells to identify tumors as targets for destruction, yet in some cases this is not enough as some cancers are also able to exploit natural immunosuppressive pathways to continue evading immune response. While we often think of boosting the human immune system, potent silencing pathways are essential to suppress circulating cells that target self-proteins and prevent autoimmune syndromes like diabetes, and Crohn’s disease. Some cancers turn on these immunosuppressive pathways, allowing them to evade the immune system. The value of both modifying/boosting T cells and blocking immune checkpoints is demonstrated in a recent set of publications from the Greenberg Lab (Clinical Research Division). In the Journal of Experimental Medicine and the Journal of Clinical Oncology, Dr. Aude Chapuis and colleagues report the findings of a recent phase I trial pairing the blockade of the CTLA-4 inhibition pathway (immune checkpoint) with adoptive transfer of antigen-specific cytotoxic T lymphocytes (CTLs). This study consisted of 10 patients with metastatic melanoma that did not respond to previous surgical and/or systemic therapy. In this approach T cells were harvested from patients and exposed to antigenic peptides of melanoma specific protein. In this and previous studies researchers exposed cells to MART1, as Dr. Chapuis explained, "MART1 is a well known melanoma epitope. We chose it because it is broadly expressed across melanomas." T cells treated only with the MART1 epitope performed poorly because they did not persist once transferred back to patients  the median survival of transferred T cells was less then 14 days. For this study lymphocytes were exposed to MART1 peptide in the presence of IL-21, which helps maintain cell renewal, and because of technical advances, the infused cells spent less time in ex vivo culture. The other strategy for this trial was to prevent tumors from silencing CTL activity using a CTLA-4 inhibitor. Phase I trials are designed to test the safety of new therapies and 10 patients cannot predict the response of an entire population; however, for some patients this therapy was very effective. Two patients demonstrated a complete remission lasting at least three years, while five other patients showed partial reduction in number/volume of tumors or stable disease. The enhanced efficacy of this approach compared to previous trials can be attributed to the persistence of CTLs in all patients. CTLs could be detected in significant numbers in nearly all patients up to 12 weeks after transfer, a dramatic increase over the two-week survival previously observed. It is likely CTLs persisted longer because a population of these cells was behaving like long-lived memory T cells. This population of lymphocytes was able to maintain the ability to replicate and ensure continued response to an antigen over time, a key marker for this behavior is Ki67, which was present on persisting CTLs. While this was a small study, it allowed researchers to begin understanding why some patients responded and others did not. Researchers hypothesized that the clinical responses might have largely been due to "epitope spreading". If CTL therapy is effective, this should result in the lysis of melanoma cells that stimulate an inflammatory response and expand the variety of melanoma specific/enriched antigens presented to naive T cells. In turn the naïve T cells should mount a de novo immune response to other cancer antigens. Indeed, lymphocytes isolated from the two patients in complete remission reacted to many common melanoma epitopes besides MART1, including, NY-ESO1, gp100, MAGE A3, and Tyrosinase. Likewise, researchers characterized CTLs isolated from patients that did not respond to therapy. These lymphoctyes expressed a marker of T cell exhaustion, PD-1. While this study inhibited immune silencing by CTLA-4 expression, some tumors also evade immune recognition by expressing PDL1. PDL1 positive tumors induce PD-1 expression in T cells and silence them. Based on these findings CTLs may benefit from anti-PD-1 therapy as Dr. Chapuis explained, "When we started the trial in 2011, PD1-axis blockade was not available for patients. If we were to redesign such a trial we would probably use PD1 axis blockade or a combination." Understanding why certain patients responded to this therapy is also informing future work. When T cells are exposed to antigenic peptide the population expresses multiple T cell receptors, some may function better than others. Finding the most common receptor in patients that achieved remission may enable a new approach. "When generating T cell products from patients (as in this trial), by exposing them to a peptide and 'growing' the autologous T cells that proliferate, there is a lot of variability in the overall 'quality' of the cell products. To address that, we are now looking into isolating T cell receptors (TCR) of high affinity that can be inserted in a viral vector and used to genetically modify other patients' T cells. For example, a potentially promising TCR might be the one that 'cured' the melanoma in our Journal of Experimental Medicine case study. This type of approach has the potential not only to ameliorate outcomes in a larger subset of patients but also to be more feasible in terms of a phase II trial." Identifying the correct TCR for such a transfer is made possible because of high quality human trials, emphasizing the brave contributions patients make towards finding cures. Chapuis AG, Roberts IM, Thompson JA, Margolin KA, Bhatia S, Lee SM, Sloan HL, Lai IP, Farrar EA, Wagener F, Shibuya KC, Cao J, Wolchok JD, Greenberg PD, Yee C. (2016). T-Cell Therapy Using Interleukin-21-Primed Cytotoxic T-Cell Lymphocytes Combined With Cytotoxic T-Cell Lymphocyte Antigen-4 Blockade Results in Long-Term Cell Persistence and Durable Tumor Regression. J Clin Oncol. Epub ahead of print. Chapuis AG, Lee SM, Thompson JA, Roberts IM, Margolin KA, Bhatia S, Sloan HL, Lai I, Wagener F, Shibuya K, Cao J, Wolchok JD, Greenberg PD, Yee C. (2016). 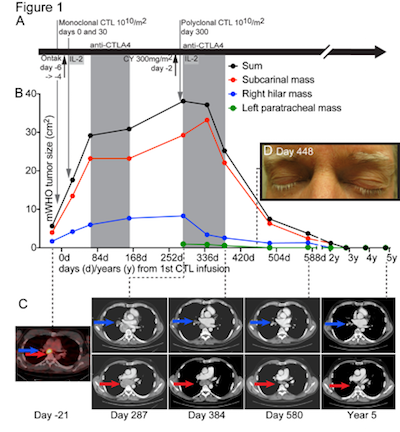 Combined IL-21-primed polyclonal CTL plus CTLA4 blockade controls refractory metastatic melanoma in a patient. J Exp Med. Epub 2016 May 30. Funding for this research was provided by the National Institutes of Health, the Entertainment Industry Foundation Stand Up To Cancer program, and the American Association for Cancer Research.